Bantario: My take on the Fantino circus! In my opinion, here's what is going to happen in the disciplinary hearing up in Orillia! Julian Fantino said it best "Hysterical Nonsense"
This disciplinary hearing is on the third appeal from the Fantino camp to have the adjudicator tossed, retired judge Leonard Montgomery was personally selected for the disciplinary hearing by Fantino himself! 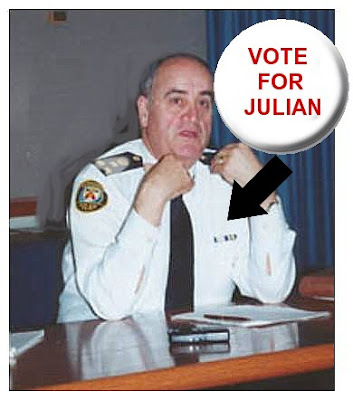 On Monday March 30 2009 The Fantino circus, the same day as the appeal was to be heard, MORE allegations surfaced from another officer, the complaint, which has not been proven, alleges Fantino "engaged in unlawful acts of reprisals against defence witnesses. The Messham probe came as a Divisional Court panel was still weighing a Fantino request to force retired justice Leonard Montgomery to step down as adjudicator in the misconduct case. In a letter to the lead investigator filed with the Appeal Court, Messham's lawyer Scott Fenton called the probe of his client a "gross misuse" of criminal investigative power. After so many appeals and heel dragging by the Fantino camp, and now rumors floating around, about Fantino retiring next year and running for the Mayor of Vaughan, which would be a great place for Mr. Accountability.Would this mean that under the PSA(police services act) that all this TAX payer money and time would be a waste, as the allegations would be considered NULL and VOID as he would no longer be a police officer?